This dress is the McCall's 7533 which I got free with a recent issue of Love Sewing magazine - though I can't remember which. It's a very simple pattern and with lots of variations. I made a size 10 - my usual for the big 4 - but the fit is weird around the shoulders and it really lifts when my arms go higher than a 45° angle. Plus, the end of the sleeve is very tight around my arm as well. I think I might chop the sleeve and see if that helps. From what I researched, it looks like the armhole might be too low for me. I've raised it a bit now and will try again soon because I really like this dress. The fabric I used came from my first trip to Denmark earlier this year. It's just a regular cotton that I fell in love with as soon as I saw it. I bought it at Stof 2000 but it no longer seems to be in stock. Floral and grey? This is definitely coming back to Yorkshire with me. In other news, I seem to have come out of my knitting rut... I finished a cardigan at the weekend - more on that very soon - and I also knitted a hat! Now I want to cast on a jumper. And I'm very nearly finished with my needlecord Rosa dress. So I'll have lots to show soon. 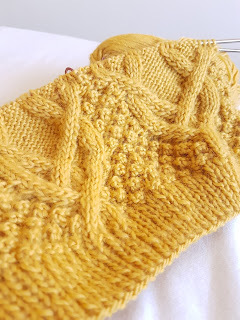 In the meantime, here's a lovely cabled teaser.